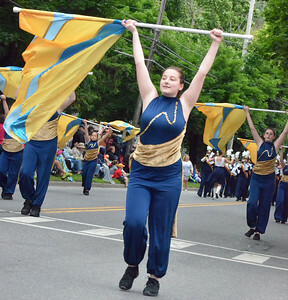 KYLE MENNIG - ONEIDA DAILY DISPATCH The start of the International Boxing Hall of Fame Induction Weekend Parade of Champions in Canastota on Sunday, June 12, 2016. 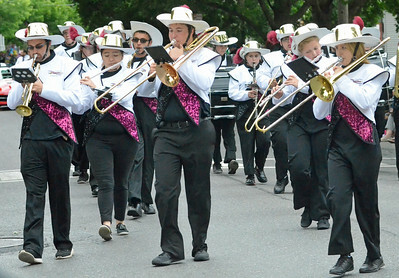 KYLE MENNIG - ONEIDA DAILY DISPATCH The Canastota marching band marches in the International Boxing Hall of Fame Induction Weekend Parade of Champions in Canastota on Sunday, June 12, 2016. 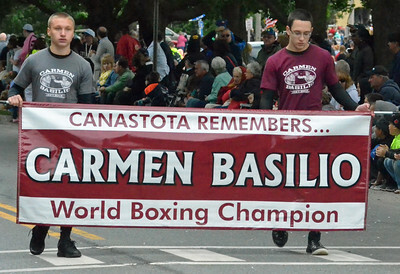 KYLE MENNIG - ONEIDA DAILY DISPATCH A banner honoring the late Carmen Basilio during the International Boxing Hall of Fame Induction Weekend Parade of Champions in Canastota on Sunday, June 12, 2016. 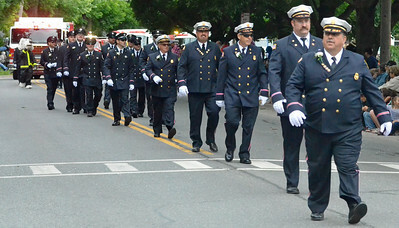 KYLE MENNIG - ONEIDA DAILY DISPATCH The Canastota Fire Department marches in the International Boxing Hall of Fame Induction Weekend Parade of Champions in Canastota on Sunday, June 12, 2016. 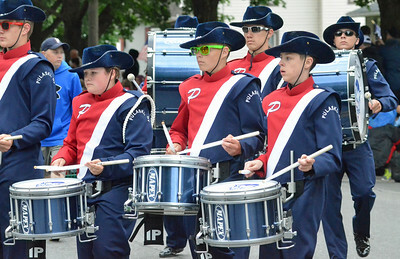 KYLE MENNIG - ONEIDA DAILY DISPATCH The Pulaski marching band marches in the International Boxing Hall of Fame Induction Weekend Parade of Champions in Canastota on Sunday, June 12, 2016. 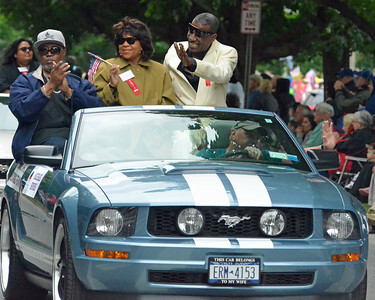 KYLE MENNIG - ONEIDA DAILY DISPATCH Boxer Michael Spinks gestures to the crowd during the International Boxing Hall of Fame Induction Weekend Parade of Champions in Canastota on Sunday, June 12, 2016. 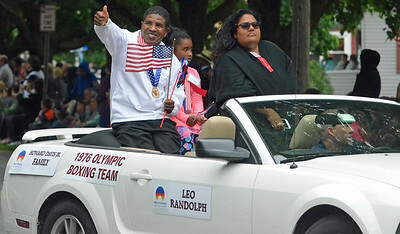 KYLE MENNIG - ONEIDA DAILY DISPATCH Leo Randolph, a 1976 Olympic gold medalist, gestures to the crowd during the International Boxing Hall of Fame Induction Weekend Parade of Champions in Canastota on Sunday, June 12, 2016. 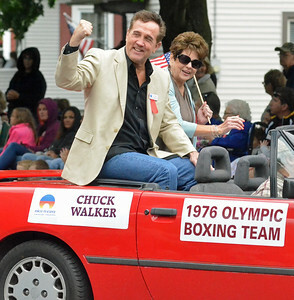 KYLE MENNIG - ONEIDA DAILY DISPATCH Chuck Walker gestures to the crowd during the International Boxing Hall of Fame Induction Weekend Parade of Champions in Canastota on Sunday, June 12, 2016. 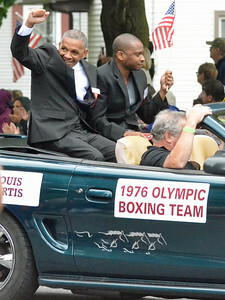 KYLE MENNIG - ONEIDA DAILY DISPATCH Louis Curtis gestures to the crowd during the International Boxing Hall of Fame Induction Weekend Parade of Champions in Canastota on Sunday, June 12, 2016. 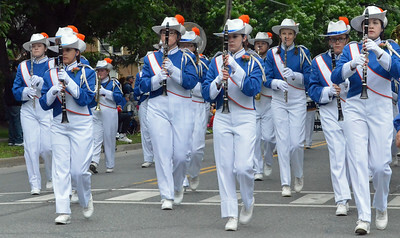 KYLE MENNIG - ONEIDA DAILY DISPATCH The Oneida marching band marches in the International Boxing Hall of Fame Induction Weekend Parade of Champions in Canastota on Sunday, June 12, 2016. 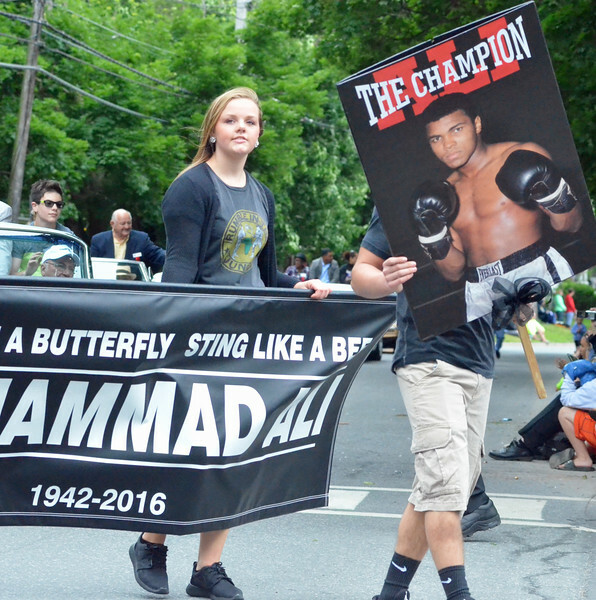 KYLE MENNIG - ONEIDA DAILY DISPATCH A tribute to Muhammad Ali during the International Boxing Hall of Fame Induction Weekend Parade of Champions in Canastota on Sunday, June 12, 2016. 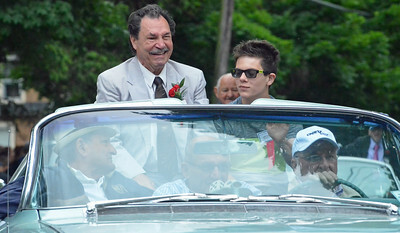 KYLE MENNIG - ONEIDA DAILY DISPATCH Billy Backus smiles at the crowd during the International Boxing Hall of Fame Induction Weekend Parade of Champions in Canastota on Sunday, June 12, 2016. 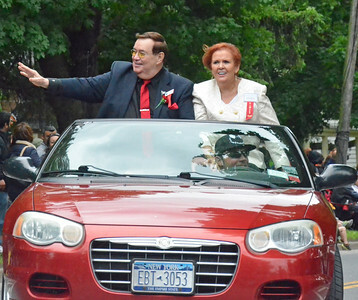 KYLE MENNIG - ONEIDA DAILY DISPATCH Dickie Di Veronica gestures to the crowd during the International Boxing Hall of Fame Induction Weekend Parade of Champions in Canastota on Sunday, June 12, 2016. 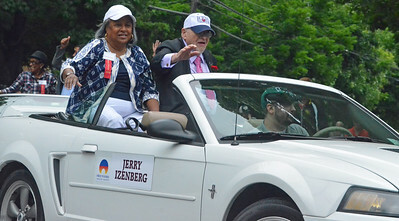 KYLE MENNIG - ONEIDA DAILY DISPATCH Class of 2016 inductee Jerry Izenberg gestures to the crowd during the International Boxing Hall of Fame Induction Weekend Parade of Champions in Canastota on Sunday, June 12, 2016. 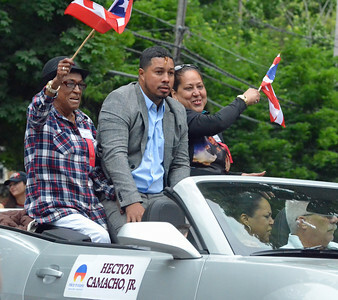 KYLE MENNIG - ONEIDA DAILY DISPATCH The family of Hector Camacho gestures to the crowd during the International Boxing Hall of Fame Induction Weekend Parade of Champions in Canastota on Sunday, June 12, 2016. 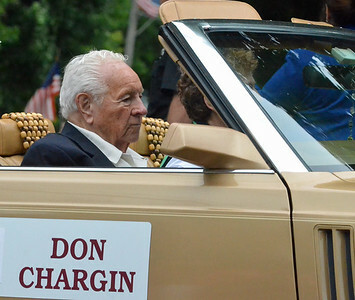 KYLE MENNIG - ONEIDA DAILY DISPATCH Don Chargin rides in the International Boxing Hall of Fame Induction Weekend Parade of Champions in Canastota on Sunday, June 12, 2016. 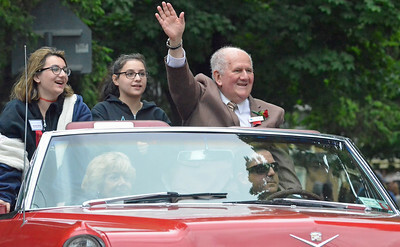 KYLE MENNIG - ONEIDA DAILY DISPATCH Class of 2016 inductee Harold Lederman gestures to the crowd during the International Boxing Hall of Fame Induction Weekend Parade of Champions in Canastota on Sunday, June 12, 2016. 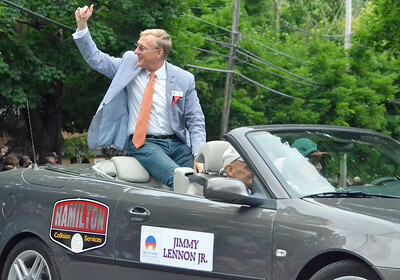 KYLE MENNIG - ONEIDA DAILY DISPATCH Jimmy Lennon Jr. gestures to the crowd during the International Boxing Hall of Fame Induction Weekend Parade of Champions in Canastota on Sunday, June 12, 2016. 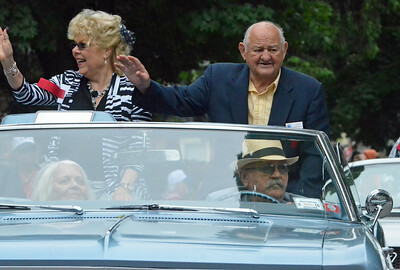 KYLE MENNIG - ONEIDA DAILY DISPATCH Jake LaMotta gestures to the crowd during the International Boxing Hall of Fame Induction Weekend Parade of Champions in Canastota on Sunday, June 12, 2016. KYLE MENNIG - ONEIDA DAILY DISPATCH Raul Marquez gestures to the crowd as Paulie Malignalli looks on during the International Boxing Hall of Fame Induction Weekend Parade of Champions in Canastota on Sunday, June 12, 2016. 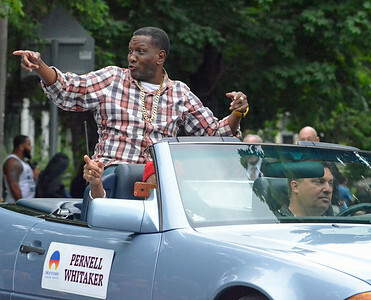 KYLE MENNIG - ONEIDA DAILY DISPATCH Pernell Whitaker gestures to the crowd during the International Boxing Hall of Fame Induction Weekend Parade of Champions in Canastota on Sunday, June 12, 2016. 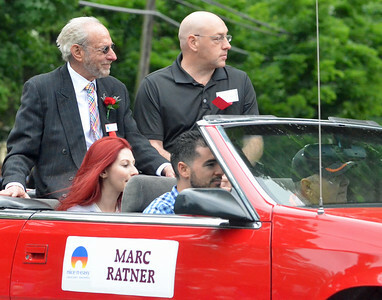 KYLE MENNIG - ONEIDA DAILY DISPATCH Class of 2016 inductee Marc Ratner rides in the International Boxing Hall of Fame Induction Weekend Parade of Champions in Canastota on Sunday, June 12, 2016. 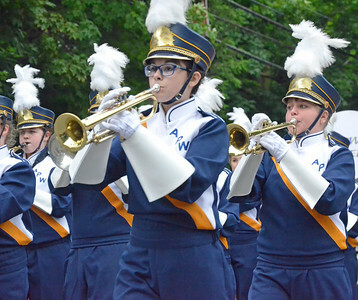 KYLE MENNIG - ONEIDA DAILY DISPATCH The Altmar-Parish-Williamstown marching band marches in the International Boxing Hall of Fame Induction Weekend Parade of Champions in Canastota on Sunday, June 12, 2016. 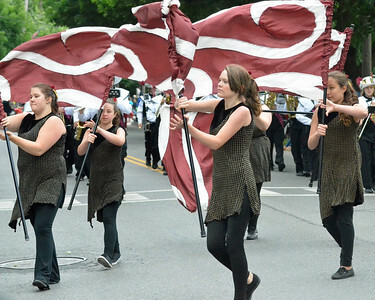 KYLE MENNIG - ONEIDA DAILY DISPATCH Andrew Golota gestures to the crowd during the International Boxing Hall of Fame Induction Weekend Parade of Champions in Canastota on Sunday, June 12, 2016. 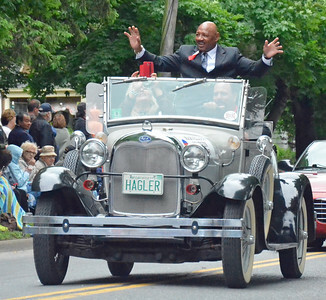 KYLE MENNIG - ONEIDA DAILY DISPATCH Marvin Haggler gestures to the crowd during the International Boxing Hall of Fame Induction Weekend Parade of Champions in Canastota on Sunday, June 12, 2016. 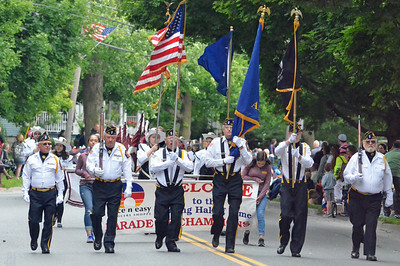 KYLE MENNIG - ONEIDA DAILY DISPATCH Class of 2016 inductee Col. Bob Sheridan gestures to the crowd during the International Boxing Hall of Fame Induction Weekend Parade of Champions in Canastota on Sunday, June 12, 2016. 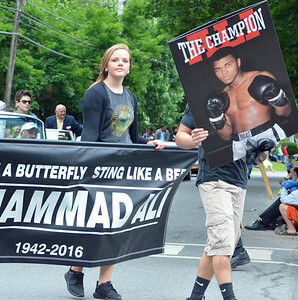 A tribute to Muhammad Ali during the International Boxing Hall of Fame Induction Weekend Parade of Champions in Canastota on Sunday, June 12, 2016.